64% of Dutch organizations with more than fifty employees opt for software solutions in the cloud. Education is an absolute front runner when it comes to Software as a Service (SaaS). No fewer than 93% of education organization use one or more SaaS solutions, followed by governmental institutions (68%) and healthcare organizations (66%). This was the outcome of a market analysis conducted by Smart Profile, a specialist in market intelligence, for which more than 6,000 decision-makers from Dutch organizations with more than fifty employees were questioned. The degree of penetration of SaaS solutions in education is so high because the online learning environments and learner administration systems that pretty much all schools use today are nearly all running in the public cloud. The transport sector continues to lag the furthest behind when it comes to SaaS solutions, with 47%; and yet it has nonetheless grown by 10% from last year. As such, the transport sector is no exception, as the degree of penetration of SaaS solutions is rising in nearly all sectors. More specifically, the degree of penetration in all branches and sectors has gone up from 58% in 2017 to 64% at present. The largest part of all software solutions concerns HR and office automation applications (both 24%). Vertical applications such as online learning environments for education, software for healthcare organizations and automation solutions for local government authorities account for 13% of SaaS solutions. Financial software and ERP systems in the cloud, on the other hand, are pretty limited, at 5% and 4% respectively. 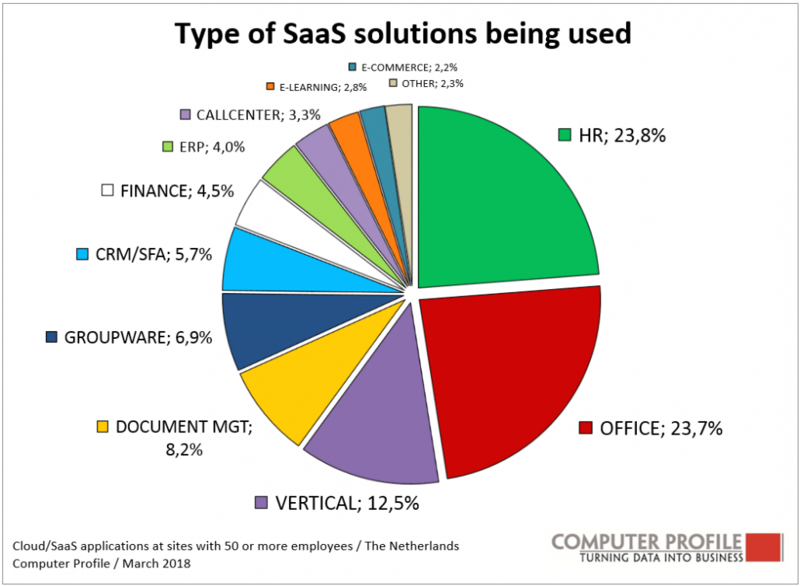 When it comes to suppliers of SaaS solutions, we find the well-known names gain in a strong market position for HR and office automation applications. 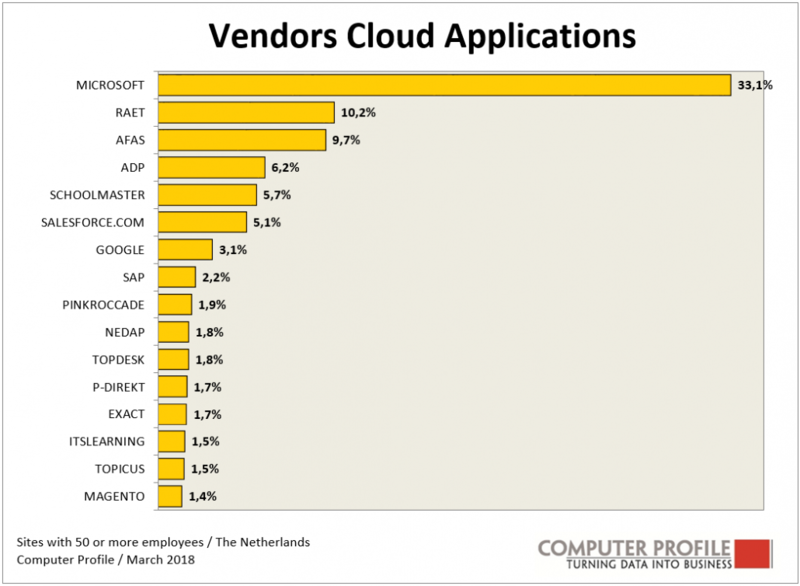 Microsoft is the leading supplier of software in the cloud (33%), mainly with Office365, SharePoint and Exchange. Second to fourth places are held by RAET, AFAS and ADP, three parties with a strong position in HR applications. In fifth place, Schoolmaster is the best scoring party when it comes to specific software for education. Salesforce, in sixth place, can be called the frontrunner in CRM solutions in the cloud. 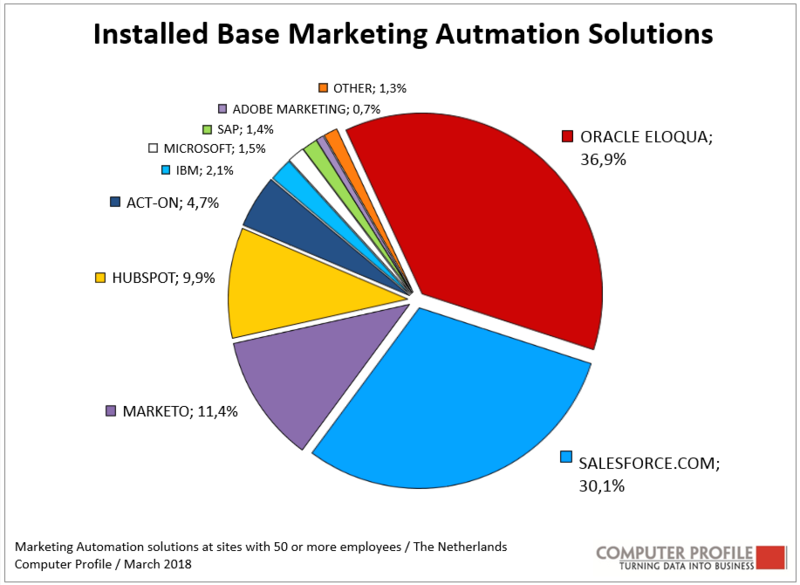 According to Computer Profile, 12% of Dutch companies with fifty or more employees use a marketing automation solution in the cloud. Salesforce (30%) is beaten here by Oracle Eloqua (37%). The top five places are rounded off by Marketo (11%), Hubspot (10%) and Act-On (4.7%).